Learn to dance socially or competitively with Natalie Beck. We were both terrified at the thought of our first dance, but after we had five lessons with Natalie we had a great routine to perform at our wedding. Natalie listened to what we wanted, gave us confidence and pushed us to learn new steps to match the song we had chosen. We started with the basics and she helped us improve and develop each lesson with heaps of laughter along the way. At the wedding, our guests all loved the dance, especially the shimmies which Natalie made us perfect! 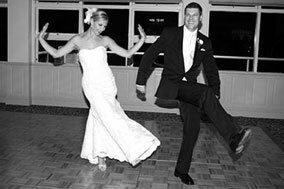 If you are as nervous as we were about your wedding dance then have your lessons with Natalie because she will make the whole experience stress free and fun!